For many, if they think of him as anything other than an excuse for a party, St Patrick, a Fifth Century priest, may seem a remote figure. But his life still has some powerful contemporary resonances. Patrick was not born Irish. He was a Briton. Different parts of Britain claim him, but he came from a Romanised family somewhere on the west coast. As a young man he was kidnapped by an Irish raiding party and trafficked across the Irish Sea into slavery. After six years he escaped and returned to his family, and his studies, in Britain. Eventually, after study in other parts of Europe, he became a priest. His story would probably not be one that is remembered by history but for the fact that after this, in a remarkable display of personal magnanimity, he decided to return to Ireland, the land that had enslaved him, as a missionary. Are you all right in the back there lads? 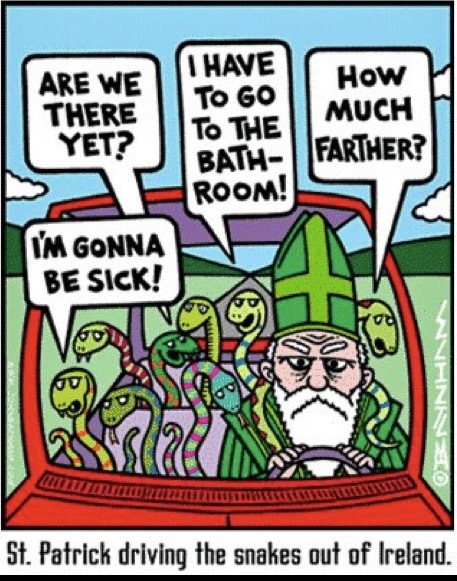 There are many fanciful legends associated with Patrick, including how he rid the country of snakes. But he left two written documents: his Confessions, a spiritual auto-biography from which many of the details of his life are known; and his Letter to the Soldiers of Coroticus, a furious protest against the murder and enslavement of members of Patrick’s congregation by a raiding party of pirates, probably composed of Patrick’s fellow Britons. The anger of this protest was doubtless further sharpened by Patrick’s own bitter memory of the violence of slavery. There are many powerful echoes from Patrick’s life with the contemporary world: For example, in a world where poisonous xenophobia seems to have taken hold in so many places the story of Patrick’s transformation from immigrant to an emblem of the country he adopted as his own stands in counterpoint. And in his protest against the war crimes of Coroticus and his men Patrick, the former slave, gave nascent voice to the ideals of human rights and anti-slavery in Western Europe. Across the world today other immigrants work to make their adopted countries better places, other slaves and former slaves resist the systems of slavery that still persist. St Patrick’s Day is a good time to remember them, and remember that after today’s parties a long struggle lies ahead of us to fulfil some of the ideals that they, and Patrick, represent. In March 2004 a group of mercenaries led by a former British officer, Simon Mann, attempted to undertake a coup in Equatorial Guinea, one of the nastiest dictatorships in Africa. Of course the motivation of Mann and his cronies was not in the least humanitarian, but rather a hope of getting their greedy hands on the country’s considerable oil wealth. They had form as “soldiers of fortune”. Mann and co were behind Executive Outcomes, a mercenary operation that stiffened the Angolan army’s campaign against the UNITA rebels during that country’s civil war. Those escapades helped Mann become a millionaire. However while Mann may have had some considerable tactical skills that could contribute to the winning of battles, his talents as an organiser of coups were much less impressive. The plan was bedevilled from the outset by difficulties with logistics and supply, not least of weapons. In the end the amateurishness of their efforts, particularly in the organisers’ inability to keep their plans secret, meant that the coup was easily rolled up by Zimbabwean, South African and Equatorial Guinean intelligence services before a shot was fired. Many of the plotters spent years in dreadful prisons in Zimbabwe and Equatorial Guinea. In addition to a forensic detailing of the twists and turns of the plot The Wonga Coup has a number of interesting revelations. For a start Mann’s plot wasn’t the first to threaten the Equatorial Guinea dictatorship. The novelist Fredrick Forsyth, it seems, had tried to organise the same thing in the 1970s to install as president his friend, Odumegwu Emeka Ojukwu, the former head of Nigeria’s Katanga secessionists. He failed, but the experience provided him with the detailed research for a novel, The Dogs of War. The Wonga Coup also details the involvement in the coup of Mark Thatcher, repellant son of the vile former British Prime Minister. Thatcher comes across as just as unpleasant as you might imagine and the account of his downfall at the hands of the South African justice system and its anti-mercenary laws is probably the most deeply satisfying part of the book. 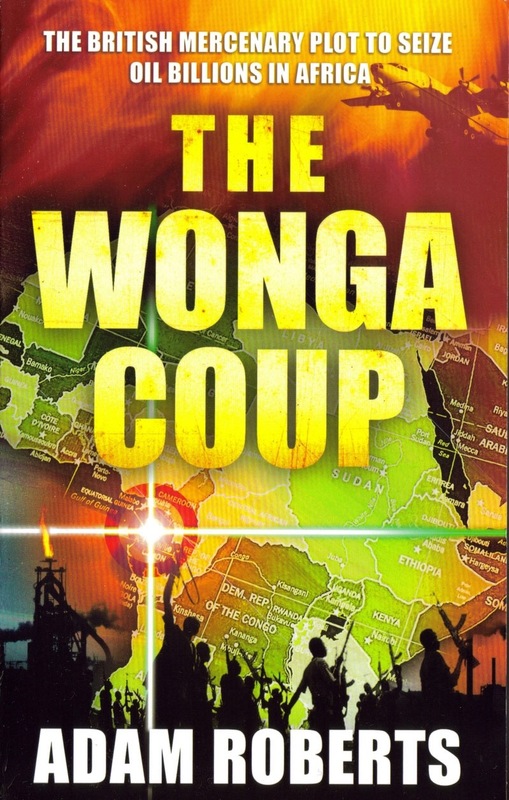 Overall The Wonga Coup is a carefully researched and elegantly written account of a bunch of wealthy, grasping thieves’ efforts to enrich themselves further, and brought down by the extent of their own overweening arrogance that rendered them capable of overlooking even their own incompetence.